For over 20 years, hundreds of women have walked through the doors of Inspirations Studio to learn how to make pottery in a safe, supportive, and transformational work environment. The studio members have contributed unique ceramic objects to the community, reducing stigma one pot at a time. At Inspirations Studio, creative practice is the means through which women achieve stability, connect with community and transition towards more sustainable economic circumstances. Pottery is a great teacher. It takes time and dedication to develop this skill to the point where a ball of clay is transformed into a beautiful object. At the centre of Inspirations Studio is a community of like-minded artists, within and beyond the studio’s walls. Many of the members have been excluded from traditional forms of community, and involvement in the Studio creates a break from isolation, a sense of purpose, and a place to go during the day. Beyond improving the emotional and mental well-being of its members, Inspirations Studio has an entrepreneurial spirit. The Studio provides the opportunity to earn supplemental income generated through sales in the shop, commissions, and outside festivals. 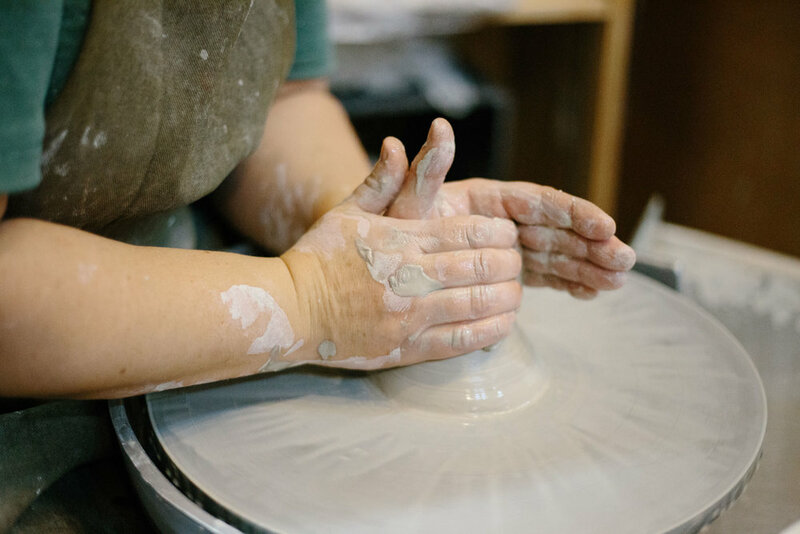 Women who qualify for the program are offered a free eight-week course which covers wheel throwing, hand building, glazing and design: all the basics of pottery making. Once the course is completed women can apply to join the program as members. With continued support from professional potters, members have free, gradated access to the studio for up to 12 hours a week and opportunities to sell their work. Members are responsible for all aspects of their own work as well as helping to run the studio, paying for their clay, and acting as peer mentors to new participants. The studio offers a range of staff and peer co-taught workshops for partner agencies. welcomes special orders and collaborations. to create economic development initiatives for the prevention of homelessness. In 2001, when 761 CDC closed, the program moved Sistering – A Woman's Place, where the Studio was supported until 2018 when it moved to St. Stephen's Community House’ trustee program. This new partnership allows the Studio to continue its search for a long-term partner and a sustainable future.